"It's such a sort of ridiculous thing, but just if they were smiling. It's not to be underestimated." 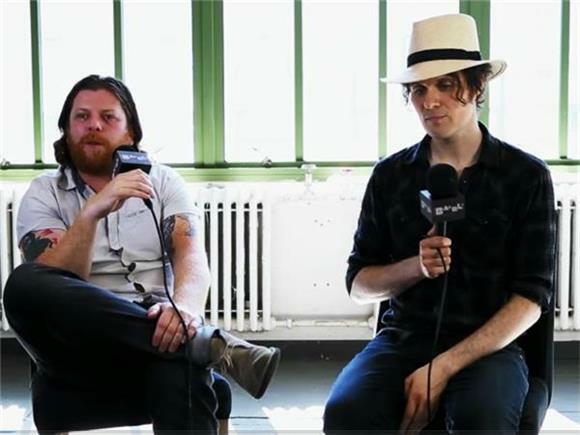 That's how Jon Fratelli, the rather gentlemanly singer at the helm of Scottish rockers The Fratellis handled a question concerning what he hopes his fans take away from one of the band's legendary live shows. "If that's it, then that's absolutely perfect. If we can do that night after night then we're quite happy". And you know, in our conversations (which happened when Jon blessed us with a few acoustic performances in session) with Jon and Barry, the two seem to be just that. Happy, content, knowing that their Southern Californian flavored new album Eyes Wide, Tongue Tied is the result of the best possible effort they could put forth on record. How many people can truly say they gave it their best shot? The Fratellis can. If you haven't heard the album please, by all means, give it a whirl. And if you want to learn a little more about the album, Jon and Barry give you the scoop on this wonderful collection of songs in our interview.